We offer different, customized solutions that are based on your specific needs. We focus on delivering high-quality service that solves simple to complex U.S. expat taxes cases and guide you through the complicated tax process. Our team of professional accountants will work to relieve your tax load by minimizing your tax liability and maximizing the available deductions. Our main service is the preparation and filing of individual’s U.S. federal income tax returns. This is the annual return and it’s required for all U.S. citizens, green card holders, regardless of your current residence. After assessing your situation, our CPAs and IRS Enrolled Agents can tell if you need to file a state tax return, depending on which state you lived in before you move abroad, and whether you are still considered a resident there for tax purposes. We can help you to determine your residency status and file your state income tax return. 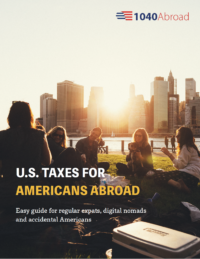 The States of California, New Mexico, North Carolina and Virginia all try to tax U.S. citizens who have moved abroad by making it both complicated for them to break their ties with the state and to find out who they are most likely to file a state tax return with. The States of Alaska, Florida, Nevada, South Dakota, Texas, Washington or Wyoming do not impose an income tax on individuals. Don’t worry if you haven’t filed returns for previous years because we can help you to go through late tax returns. Throughout the years, we have helped expats to become compliant with the government and will introduce you to the most appropriate ways to navigate this process. There are particular IRS amnesty programs, such as Streamlined Procedures, which are for those who didn’t know about U.S. tax obligation and are, thus, considered to be non-willful. This usually leads to lower penalties, or no penalty all, and is done by filing six years of FBARs and three years of tax returns. 1040 Abroad’s expert teams will help to you find the correct solution. The deadlines for filing tax returns are a little different for U.S. persons abroad. April 17 is the filing deadline for most taxpayers. June 15 is the filing deadline for expats. October 15 is the filing deadline for requesting an extension. April 18 is the deadline to pay a tax due. You must pay any taxes due by April 17, 2018, even if you’re an expat filing your return by June 15, 2018. Most Americans abroad qualify for an automatic two-month filing extension, so your return is due by June 15, 2018. If you don’t pay the tax due by April 17, 2018, the IRS will not assess a Failure to Pay Penalty if you file and pay by June 15, 2018. You will, however, be charged interest on the unpaid amount. If you live in a country that follows a non-calendar tax year, such as the UK or Australia, your U.S. tax information is still reported on a calendar-year basis. But, in this case, you can request an automatic six-month extension to file. This gives you more time to gather information before the end of the tax year of the country where you are currently living. The expat tax filing deadline with an extension is October 15, 2018. However, you must request this extension by filing a form with the IRS by the original due date of your return. From 2017, this now coincides with the U.S. tax deadline of April 17, but an automatic six-month extension is available. This is to be filed if a bank account, mutual fund, trust, brokerage account or other types of foreign financial account, and the total value of all of the financial accounts combined, was $10,000 at any time during the calendar year reported. * A United States person includes U.S. citizens; U.S. residents (green card holders); entities – including, but not limited to, corporations, partnerships, or limited liability companies, created or organized in the United States or under U.S. laws – and trusts or estates formed under the laws of the United States. Note: For the 2018 calendar year and beyond, the due date for U.S. citizens is April 15th (April 17th in 2018), and there is an automatic extension of two months for U.S. expats, but the taxes owed should be paid by this date even with the automatic extension. An extension is available, which extends the due date to October 15th. Filling the FBAR doesn’t exempt you from FATCA reporting because the FBAR is filed with the U.S. Treasury, whereas Form 8938 is filed with the IRS. It is important to know that failure to file Form 8938 will result in a penalty of $10,000 per form for more than 90 days after the IRS mails you a notice of your failure to file. This will be increased by $10,000 for each 30-day period that the failure continues. A U.S. citizen abroad can keep nothing hidden by using Streamlined Procedures. There are potentially no penalties if you file late tax returns with all of the required information for the last three years, and any delinquent FBARs for the previous six years. To qualify for the Streamlined Procedures, you will need to demonstrate in a written form that your previous non-compliance was not willful. We will provide you with a certification statement. 1040 Abroad’s tax experts have dealt with numerous clients through this process and will ensure that you have the best option to qualify for this. Throughout the years, we have gathered the best tax experts at 1040 Abroad and we are willing to help you with the correct tax planning, assessments, and reviews. Our CPAs and EA have extensive experience of guiding each of our customers through complicated tax procedures and helping them to meet their requirements so that they are tax compliant. Moreover, we can advise you about moving abroad, assess your current situation and provide customized solutions for you. You can book your appointment now by contacting us by using a contact form. If you are a U.S. person who is living and working in Canada, we can help you to prepare your Canadian Tax return. We have wide experience of dealing with clients in Canada and, therefore, can make all of the calculations and share our expertise in working with expats who currently reside in Canada. Our tax teams know how to use the available options to maximize tax savings and ensure the best outcome for you. Immigration to the U.S. and emigration from the U.S.
Our company was founded by a naturalized U.S. citizen, who went through the immigration process by himself when he moved there from France. This real-life experience helped him to acquire knowledge that can help you to immigrate to the U.S. legally, safely and hassle-free. If you are looking for ways to emigrate from the U.S., we can provide you with a wide range of consultations, including ways to safely go through this process, choose the best destination to start your expat life and stay tax compliant while enjoying your new experience abroad. You may be an American by birth without ties to the U.S. anymore or an Accidental American. You’ve lived most of your life abroad, building your career there, and have family and friends there, but you are still carrying the tax burden of being a U.S. citizen. We will help you to take that last step to renounce your U.S. citizenship and move forward without being burdened with tax responsibilities. It may be a complicated and complex thing to do, but we have dealt with such cases before and will guide you through the entire process. Note: A person’s renunciation affects only the person. None of their family members lose U.S. citizenship or are otherwise treated any differently for any U.S. legal purpose.